We headed to Allegany SUAR this weekend and had a fantastic time. I just started law school and unfortunately have classes on Friday until 12. Luckily my parents were heading up on Thursday and taking the horses to give them some extra time to settle in to camp. I left Baltimore promptly at 12 and arrived at ride camp at about 5:45 with an uneventful drive up. The horses were already vetted and ready to go. Kirah and I were to tackle the 75 miler, her first distance above a 50 (and only her third “endurance” ride). It was a daunting task and the ride was to be a difficult one, but we were going to at least give it our best shot. We were riding with my Dad and Moniet as well as off and on with a friend (Dana) and her horse Charlie. The Friday night ride briefing was held in good spirit, and I even got a serenade from the entire clan in honor of my 21st birthday. Patti, the ride manager went over all of the loops detailing lengths, holds and the like. Our loops were to be Blue (10 miles) out to our away check at Bradford for a 15 minute hold. Then the Blue lollipop (10 miles) back to Bradford for a 30 minute hold. Back to the Blue lollipop for another ten miles and then a 15 minute gate. After that we headed back to camp on Green for 12 miles, with a 40 minute in camp hold. Next was the yellow loop (12 miles), followed by another 40 minute hold with the Red loop next (10 miles). One last hold (40 mins) and another jaunt over the red loop and we were done. Our ride would start at 6:15, and there were 12 riders in the 75 miler. The wakeup call came at 4:45 and we were up and ready to get going. The horses were eager as we walked around camp to warm them up. We got tacked and ready to go by 6:10 walking them around camp awaiting the start. We started in the middle of the pack of 12 and quickly ended up in the back when Dad’s saddle pad slipped out . We easily made it up the first big climb with fresh horses, knowing that they would have to climb it several more times today (unbeknownst to the horses!). We continued on down the beautiful scenic trail and quickly made it to the 15 minute hold. We cooled the horses out while they were chomping down. The 30 minutes flew by and in no time we were heading back out on the blue loop again. Kirah still had lots of energy and we were leading most of the way. I got down and ran a good portion of the downhill this time before almost running out of breath lol. We headed back to Bradford for our 15 minute gate. We had to pulse down within the 15 minute time frame but the time we pulsed didn’t affect our hold time. We didn’t have to vet, just pulse in, Kirah’s pulse was at 48 when we headed over J. The time went by in a blink and we were a bit late heading out in a rush. We were headed back to camp on the Green loop a mere 12 miles. Kirah was still doing beautifully with no signs of fatigue although Moniet was getting a little tired. So on this loop we went slower and stopped for grass every so often. The trail was uphill and then plateaued out and we rode along the ridge for a while trotting and cantering in blissful joy. We eventually started heading back down the mountain and I got off and ran down again, hopping back on at the bottom of the hill and continuing on. We came back to the camp and wound around the little meadow so that we would come down the common trail hill to the vet check at base camp. We pulled tack and cooled the horses out easily, vetting in with ease and happy horses. They ate and drank well for the entire 40 minute hold and we were headed back out on the Yellow loop. We had to go back up the big hill (the same one from earlier) and the horses were far more weary this time, but had regained some of their energy and were still chugging along. The Yellow loop was the longest for us and the hardest. It started out with that first big hill, and leveled out for a bit and then started heading down in an easy slope. Once we reached the valley we cantered along on some nice flat trail for quite a while. We came out on a road and turned left and went back up into the woods. And back up the mountain. This was my low point for the day, the trail went up and up and up and it was the longest uphill imaginable. Kirah was still happily chugging along we trotted whenever it leveled out even for a few steps. I was simply astonished at her and her abundance of energy and willingness to go forward. Finally we got to the top of the hill and headed back the way we came. Descended the steep hill and made it back to camp for our next 40 minute hold. The horses pulsed down very quickly and we vetted right through. Kirah was eating everything in sight during the hold and had no signs of soreness or unhappiness at any point. We headed back out on our first of two trips on the Red loop. We were hoping for an easy loop since we’d already gone 55 miles and we would have to do it twice. Kirah was not very happy that we were going out again and she certainly didn’t want to climb the gargantuan hill again. She picked up after we hit the flat and started back out on what had been the Blue trail earlier. It made a right up a steep hill when it split from the Blue. I hopped off and walked up the hill and when it ended hopped back on and let the horses eat grass for a while. We continued on about a mile and half to end the lollipop. The last couple miles were easygoing and we made it in short order. The first and second place 75ers came up behind us and lapped us, we followed them in, it was a great treat to see them finish! We pulsed down almost immediately and vetted in for the last time. Kirah’s CRI was 48/44 and we got some great kudos from the vet J She was by far surpassing all of my expectations for the day. One final time to go on the red loop and we would be done. None of the horses wanted to go back out, it was starting to get dark and it was drizzling. We made it all the way to the steep uphill before it got completely dark, it seemed much faster that time around and we knew we were almost done. We made it to the last big descent back into the camp and walked slowly and soon saw the campfire and knew we were done. Without removing tack the vet went ahead and pulsed us and Kirah was at 56. Nick told us to pull tack so we could go ahead and complete. We trotted out and he finished checking and we were DONE!! We had all done it and it was awesome. I learned a great deal about my horse this weekend and had a great time doing it. I can’t wait until the next ride! We were sitting around the club after a ride. The conversation turned to great races and tests of horseflesh. One man held that the Grand National was the hardest race of all, demanding more of horses and riders than any other. From one corner of the porch came a noise that sounded suspiciously like a snort. We turned. It came from an old fellow named Thomas. "A lot you fellows know about hard races," said he. "Let me tell you of one. What would you think of a horse race 1,800 miles in length?" Thereupon Thomas told us about the longest horse race ever held in America, also the hardest: a race clear across the United States from north to south; a horse race, 1,799 miles long. All the men within hearing-distance were horsemen, but I doubt if any one of them had ever heard of this race before. Yet it took place within the lifetime of at least six of those present and was publicized at the time. It was held in 1866. Two enterprisers of that age, Elias Jackson (Lucky) Baldwin and Richard K. Fox, promoted it. Horsemen from all parts of the country took part. The winner of the race, one of Americas greatest horsemen, is still alive. His name is Frank T. Hopkins and he lives in retirement in Long Island City, across the river from New York. He had been dispatch rider for Generals Cook, Nelson A. Miles, Terry, etc., had come up from Arizona, where he had carried dispatches in the Geronimo campaign, and he learned of the race from his old friend, Buffalo Jones, who paid his $150 entry fee and backed him to win. Mr. Hopkins signed on in a small store opposite the post office at Fort Russell, Wyo. As soon as I learned of the race and of Mr. Hopkins I sought him out to learn from him the true story of the hardest test on mount and man in the annals of American horsemanship. 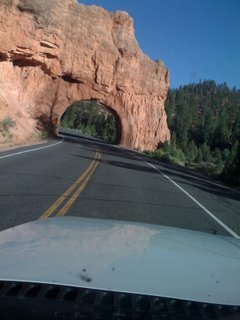 Far and Redford were not very well prepared for Bryce, so I was not very motivated to make the trip. I'm glad I went. The drive up through Flagstaff is always nice because the temperature drops so quickly. I stopped for gas before heading north into the wilderness south of Page, then west to Kanab and north past the Mt. Carmel base camp. I got to the Bryce base camp at 8,000 ft in just over eight hours. I slept well, considering it was the eve of the race I'd waited years to ride. My first 50! Still, when my alarm went off at 5:30 Sunday morning, I was already lying awake on my cot inside the horse trailer, listening to distant thunder and Aaruba's growing restlessness as raindrops dappled his blanket and neck. I pulled my riding clothes -- which felt at least as cold as the 34 degree air -- into the warm confines of my sleeping bag and struggled into them. My boots were colder still, but I was far too busy ticking off my pre-ride to-do list to care. First: Feed Aaruba. He wasn't interested in hay, but that didn't worry me as I'd heard him munching consistently throughout the night. He deigned to consume a couple pounds of Equine Senior before resuming the nervous pacing of his pen. Second: Feed self. I munched half a bagal with peanut butter while trying unsuccessfully to discourage Aaruba's pacing. Third: Apply Easyboots. Normally, Travis does this for me, but he was home with the flu. I grabbed a hoof pick, a handful of nylon stockings, and a boot. Slipping two stockings over Aaruba's off hind hoof to help prevent gaiter rubbing, I went to work. It was a bit like trying to stuff a very squirmy anvil into one of those plastic Easter eggs, but by the time my friend Jennifer arrived at 6:30, I'd progressed to the second hind boot. I panted a greeting and resumed my wresting match with Aaruba's foot. By the time I continued to the more-cooperative front boots, I'd shed four layers of clothing, all the way down to a tank top in the dawn twilight. On the bright side, the rain had stopped. At 7:00, both ridecamp and Aaruba were wide awake, and I was immensely grateful to have Jennifer handy to mix electrolytes, then hold Aaruba while I finished tacking up for the 7:30 start. She also got out her camera and started snapping. As usual, Aaruba calmed down the moment I swung astride. We checked in with the ride officials, then paced up and down with the other riders, warming up and waiting for the trail to open. Knowing Aaruba's tendency to be competitive, I made sure he and I were headed away from the starting line when 7:30 arrived and most of the horses took off. No racing today -- he'd need that energy later. We set off once the leaders were well out of sight, but alas, my plan was thwarted by a U-turn at the very beginning of the loop. The moment Aaruba saw the herd ahead, his race brain kicked into high gear and I had a battle on my hands. 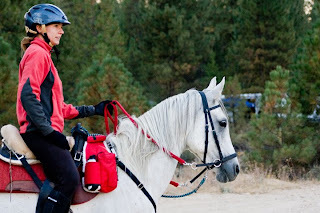 He snorted fire when I refused to let him trot like a maniac over the rocky terrain, and as a few more riders came up from behind as we circled, he became so agitated that I dismounted and led him almost a mile up the trail before he quieted. We carried on, alternating walking and trotting, stopping for an occasional mouthful of grass as we climbed up a long hill, then down again to a narrow creek where Aaruba drank deeply. Just over the creek was the section of trail we'd been warned of at the ride meeting: A couple hundred feet of rather narrow, very steep uphill made slick by the passage of many ATV tires. The sides of the trail offered more crumbly footing, but also tangled shrubs that I feared would catch an Easyboot. I pointed Aaruba up the center of the trail and grabbed mane. He plunged upward in a series of powerful leaps. Halfway up, he drifted to the right as if to ask, "Are you sure, Mom?" (Or maybe it was, "Lady, are you nuts??") A touch of the rein set him straight, and he motored on, bumping my heels with his stifles as I crouched in two-point to free his back as much as possible. We crested the hill in a surge of adrenaline that powered him along yet another logging road, this one freshly scarred by heavy machinery, then through a long and scenic stretch that I thought must be leading us back toward camp. I estimated we'd averaged 6.5 or 7 mph, and a glance at my watch told me we should finish the 20-mile loop at about 10:30. Sure enough, it was 10:25 when we finally caught up with another rider as she crossed the paved road that told us we were less than half a mile from camp. We rode in together, and Aaruba pulsed down exactly 180 minutes from the start. "Number 510, in at 10:30, out at 11:15!" We vetted through with all A's except for an A- on gut sounds, which seems to be typical for Aaruba, then headed to the trailer. I removed his bridle and interference boots and left him in his pen with a pan of soaked beet pulp, a flake of alfalfa, and Jennifer (to keep him from rolling with his saddle on) while I ate a banana and mixed another dose of electrolytes. By the time I'd checked Aaruba's pasterns for gaiter rubs -- none! -- and emptied out the sand that had collected in his stockings, it was time to tighten the girth and go. We were a couple minutes late out of the hold, but no matter. I figured we were already in last place, and besides, we had nothing to prove. All I wanted was to complete the race with a healthy, happy horse. Aaruba loved the early part of the 18-mile loop, a bit of technical singletrack that bounded up and over a series of short, sharp hills as it swooped down to the creek and up again, finally spilling us onto a wide road of decomposed granite that led up, up, up toward the clouds that billowed dark on the jagged horizon. A chilly wind swept us along the trail and I wondered if I shouldn't have abandoned my jacket at the trailer after all. But as we kept climbing, mostly up and a little down, the exercise of riding kept me warm. About halfway through the loop, Aaruba's energy seemed to flag. No wonder -- we'd already covered more miles than he'd ever done before! Still, I knew were were just over halfway, so I dismounted to run with Aaruba. By taking the lead for a while, I hoped to give him a mental break as much as a physical one. We'd been on Loop 2 for almost two hours when I heard female voices drifting on the wind. Several more minutes passed before Aaruba and I rounded a bend just in time to glimpse a pair of horses on the trail ahead. Aaruba perked up at once. He clearly had plenty of gas left in the tank, and we caught up with the other riders in short order. They were taking it easy because their horses had completed the Day 1 50 as well, so rode with them only briefly before trotting on ahead. Soon, a sign on a paper plate informed us we were one mile from camp. Only a mile? We were ahead of schedule! Aaruba seemed to sense my excitement. He hustled down the last bit of trail, paused for a long drink at the first water tank he saw, then walked on to the pulse down area. In at 1:43, out at 2:28, and all A's from the vet -- even gut sounds. More hay and electrolytes for Aaruba and a plateful of barley salad for me, then it was back on the trail for the final 12 miles. A few horses were finishing the third loop as we started out, and their presence seemed to rekindle Aaruba's enthusiasm. Though we soon found ourselves quite alone again, he plowed along almost as though we were just starting the race. I found myself working to pace him, lest he burn himself out before the end. Still, we tore through eight miles or so before the day's work seemed to catch up with him. I noticed that although he remained quite sound, he'd grown reluctant to trot downhill -- Tired muscles? Sore shoulders where the points of the saddle tree slid forward against them? -- so I either dismounted to jog down, or held him to a walk while descending slopes. I later discovered that his skin was a little sore from the motion of his saddle pad in the lumber region, a problem both quick to disappear and easy to remedy. At 4:10, I promised Aaruba we'd be done in half an hour or less. Sure enough, it was 4:28 when we broke out into the rocky wash, crossed the creek once more, and headed for home. Jennifer was waiting with her camera as we approached the finish line, and the ride officials who knew it was our first 50 cheered as we trotted across. I didn't catch our exact finish time, but I think it was about 4:35, giving us a total ride time of 7:35 at an average speed of 6.7 mph. Perfect. Even better, Dr. Washington (who, incidentally, was one of the vets involved with Aaruba's near-fatal impaction colic last October) marked all A's on Aaruba's completion exam. I couldn't have been prouder of my boy. "So," Jennifer asked as we meandered back to the trailer. "How was it?" "Easier than I expected," I said. "Guess I'll have to try for 100!"